I don’t normal bother with analysing spam, however two received yesterday caught my attention. Mostly they were noticeable as they avoided my usually bulletproof filters. Both spam emails are similar in subject, content, and sending options. Sender address was spoofed (surprise, surprise) in this case I supposedly sent the email myself, from the same account as the destination. This is a technique that I’ve started seeing more frequently, I’m assuming that this is to bypass sender white/black-lists. Content is a single line, ultimately linking to a ‘medication’ sales site. (hxxp://plfctqvlam.wipvoqen.cn/ and hxxp://sbuih.gukceyiq.cn/ [Standard Disclaimer: Links may be nasty, don’t blame me if they do nasty things to your machines]). Fortunately, or unfortunately depending on your point of view, Wepawet analysis states the sites are benign so no interesting samples for further analysis. As expected both URLs are linked, being hosted on the same 3 IP addresses: 58.17.3.44, 58.20.140.5 and 220.248.167.126 [same disclaimer as above]. Whois records show that the IP addresses belong to separate organisations, but ultimately all IP addresses are allocated by “China Unicom Hunan provincial network”, AS9929. Nothing groundbreaking in any of this, just a (slightly) interesting way to kill 30 minutes on a sleepy Sunday afternoon. Update 2 (2009/04/29): Looks like a wide spread spam run, Malware City have just posted some analysis on the same emails. Update 3 (2009/04/29): Great write-up by Dancho Danchev on his blog (more domains than I’ve seen personally). Also include a nice diagram of the DNS/server infrastructure in use, nice work Dancho. ‘WEP is insecure and breakable’ – No surprise here, everyone knows this is the case. But there can be a large difference between knowing something is theoretically possible and seeing the security provisions fall over merely by being looked at. Recent InfoSanity research has shown WEP is still found on 30% of real-world access points. This means that WEP security is still a valuable skill for anyone working within information security. One of the best sources for wireless security information is the Aircrack Project (site currently unavailable, Google cache can be of assistance for the impatient). The tutorial section of the site contains many great walkthroughs and guides to all aspects of wireless security I’m not going to attempt create an all encompassing guide to WEP security, but merely to provide a real-world example of compromising WEP. First phase of any wireless compromise is to locate and identify the target network, this could be achieved with any number of tools, personally I activate airodump-ng from the aircrack suite with minimal parameters (bt ~ # airodump-ng wlan0). From the target network collect the station MAC address (BSSID), network name (ESSID) and operating channel. where -b and -e parameters are the targets BSSID and ESSID respectively. The output will show if packet injection is possible, and the reliability of that injection. The Aircrack documentation states that injection rate should be at or near to 100%. Whilst this is beneficial, I have successfully completed an engagement with injection as low as 15%. -w filename, specifies the file to write captured traffic to. This is where the packet injection ratio determined by the –test function comes into play, the Alfa card with RealTek 8187 chip in use during this engagement generally injects packets at a rate of 500 packets per second, in this scenario the test function report 92% success, airodump-ng reported capturing approx 490 packets per second. In this case overall engagement required less than 15 minutes from finding network point to obtaining network key. From here it’s trivial to get a machine connected to the wireless network, in many cases this provides direct access to the soft and fluffy internal network, and from there? World (target network) is your oyster…..
As promised when the postman delivered the Alfa equipment, I’ve done some initial analysis of my first wireless capture. The data being analysed was collected during the evening commute back home, a trip that includes urban, sub-urban and rural areas so should be good representative sample group. The previous wireless post has already touched on the security aspect of the found access points. 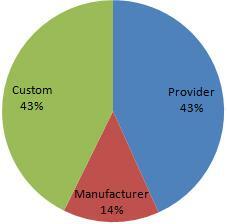 The chart below shows the breakdown between the the various security implementations. The WPA+ category includes WPA, WPA2 and WPA2WPA columns (as categorised by airodump-ng). 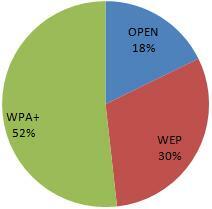 Due to the known insecurities within WEP, almost half of the encountered access points do not have any reliable security in place to protect the attached network and users of their networks. The issue is shown by the split of the BT Home Hub devices, BT are one of the major telecommunications providers within the UK. The initial Home Hub (with default ESSID of BTHomeHub-####) are, in this data set, exclusively protected by WEP. In contrast the majority of newer versions of the same device (ESSID: BTHomeHub2-####) operate with the WPA/WPA2 protocols. Another large UK telecoms player, SKY appears to take security of their provided devices seriously all encountered access points configured with SKY’s default ESSID (SKY#####) almost exclusively employ WPA. 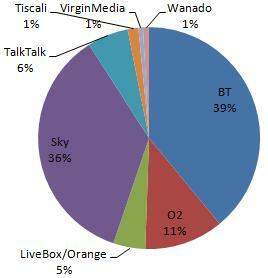 The chart below shows the provider breakdown of the encountered access points (obviously we are unable to determine the provider of access points with a custom ESSID), with the dominance of BT and Sky in this area the default configuration of their devices could be crucial for a large number of home users. Whilst some default configurations are insecure, some modified configurations may inadvertently provide additional information to potential attackers. One advantage behind default configurations is that it can be difficult to determine the location or physical connections of any given access point, however the ESSID can provide a good probability of determining the physical connections. Numerous access points within the data have ESSIDs set to an address or individuals name, this is potentially unavoidable for businesses. Whilst security through obscurity can never replace solid security, some obscurity and misdirection can reduce risk and volume of compromise attempts. As a prime example, this data set includes an access point related (assuming ESSID is relevant) of a local branch of a national bank, more worryingly the access point appears to be running WEP. A large volume of modified ESSIDs are given ‘humorous’ values or references to pop-culture. Some network names may be references/retorts from the network owners in response finding unauthorised users on the network, Dont-steal-our-network and we-know-who-u-are-thief. Both these networks run WPA2, potentially learning the security message the hard way. The last network name that caught attention may be an attempt at offensive security, the ESSID reboot may potentially be an attempt to trip up malicious users parsing available networks through poorly considered shell script. Within the dataset analysed the findings show that wireless infrastructure is becoming widespread. Further to this, the volume of default and insecure configurations may indicate that the usage and security implications of wireless connectivity may not be well understood within the general population. The growing trend of wireless enabled devices to be shipped with secure default configurations is a positive move within this field. We’ve just completed the initial build for a new standalone IDS sensor running Snort. Having had previous experience (~1.5 years previously, manual source compile) I was amazed with the ease and speed with which the system was built, configured and operational. Installed OS, latest Debian build via net install. Debian package for the Acid/Base web front end. Each stage required some additional configuration steps but all were intuitive, or solvable with a couple of minutes Google-Fu. Only real (and still minor) stumbling block was the Base front end initially complaining about the ADODB modules, as one of the Apt steps stated that this file had moved and would need fixing in the configuration we spent some time trying to locate the location within our installation. Only to find that all prerequisites weren’t met with the package installs, a quick #apt-get install php5-mysql rapidly fixed the issue and all was good with the world again. Only task still on the To-Do list is to install the Debian Oinkmaster package to ease Snort rule updates and allowing finer grain control over the process. The sensor is now fully functional but still in need of some tuning to reduce the noise ratio of alerts. A useful addition to the security toolbox in less than a few hours, not bad for an afternoon’s work. A couple of SANs ISC diaries (“Recent VMware updates available” and “VMware exploits – just how bad is it?“) should be a concern for anyone running a VMware lab (or VMware production environment). The ISC diaries explain the situation better than I could, but to cut a long story short the exploits allow a malicious user/payload to escape the guest system and gain direct access to the host. If you’ve got an interest in information security, then there is a good chance that you’ve got a good handle on malware in all it’s (in)glorious forms. The books, articles and war stories are nice, interesting and can result in some improved knowledge but to get a real feel for malware nothing beats live samples. Best way to get live samples? Get infected! To manage this without bringing your network and organisation to it’s knees best practice is a honeypot, in one (or more) of it’s various forms. For exactly this purpose I’ve been running the Nepenthes application for around 10 months. Nepenthes is a low interaction honeypot which emulates several known vulnerabilities across multiple services in an attempt to capture live malware samples as it is ‘exploited’. The Nepenthes services advertise known vulnerabilities, emulate service interaction to the point of exploit and final store the shellcode/binary provided by the malicious system. If my honeypot system is any indication, these systems will and do get pounded heavily from prospective intruders, over the lifetime of my honeypot systm I have collected in excess of 850 unique malware samples. In fact when the system was first installed it captured it’s first malicious binary within 30 minutes of gaining a live network connection (in this case an IRC bot). Honeypots (of any variety) also provide a good return on investment even in environments where the analysis of malware isn’t a primary (or even secondary) concern. As the honeypot server has no legitimate services then the only traffic targetted at the honeypot should be malicious. Placed externally, this can provide an early warning system for attacks that eventually target legitimate systems and can give system administrations a better indication of the types and frequency of attacks that will be directed at live services. Placed internally they can help identify any internal infections, as compromised systems sweep the internal networks for other vulnerable hosts and trigger the honeypot. These logs can also help identify the root cause of any infectiona and potentially the initial infection vector. Ultimately honeyput systems of all varieties have a myriad of beneficial uses. There is an enormous wealth of high quality information available from the various honey pot organisations, for example Shadowserver, the Honeynet Project and Carnivore.IT (home of Nepenthes). I’ve just taken delivery of, and started to experiment with, my new wireless equipment consisting of an Alfa AWUS036H and some additional antennas. My primary (official) motive for purchasing new hardware was that my primary incident response laptop only has 802.11b internal so can’t connect to newer networks (and I’ve just upgraded my home network to a 802.11g only access point). Unofficial reason is that I have never owned a wireless device capable of packet injection and other advanced wireless penetration techniques. In this regard the Alfa comes very highly recommended, both from Aircrack’s own documentation wiki and from security guys in the field. In my testing so far the Alfa has performed admirably on all accounts. In addition to the Alfa I acquired an additional antenna with magnetic mount, perfect for many tasks including mounting to the roof of a moving vehicle for a bit of data gathering. Despite being a life-long geek, I was still amazed by the concentration of wireless network devices available. In my first test I left my equipment running whilst I made the short commute from work to back home, during this trip I collected details of 1100+ access points and 250+ active clients. From these straw poll statistics the level of security implemented was concerning although not completely surprising. 200+ of the access points were running with no encryption at all, whilst this is mitigated by the fact many appear to be (going from essid) publicly provided networks designed for guest use (for example BTOpenZone) many also appear to be for home use or merely devices in their default setting. 300+ of the APs were running with the provenly insecure WEP. The remaining 600+ access points were configured to use a combination of the more secure WPA and WPA2 frameworks, although less than 80 of these devices were configured to use the more recent and secure WPA2. Best feature of my new equipment? New possibilities and ideas! So far my head is buzzing with new possibilities so watch this space. At a minimum I want to add a GPS reciever to my wireless arsenal; currently looking at the TripNav TN200 which was suggested by Antonio Merola in his SANS reading room paper Wi-Fi with Backrack. The device seems to get good reviews everywhere I’ve found, but the paper is slightly dated (2007), if anyone has any suggestions for better hardware let me know.